Texas-based non-profit EarthX is hosting the world’s largest environmental expo, conference and film festival from April 13-22, 2018, in Dallas. The EarthX three-day expo, five-day group of conferences and 10-day film festival champions progress and innovation by bringing together environmental organizations, businesses, academic institutions, government agencies, interactive programming and thought leaders with interactive and immersive family entertainment, live music and sustainable food pavilions. 400 speakers are confirmed for 2018. Visit earthx.org to register for the 2018 event and receive free admission. For all details, go here for the event guide. At this pop-up community dinner, EarthX will bring farmers and ranchers together with those who love food, film, music and community gatherings. Screenings of that agricultural documentaries One Hundred Thousand Beating Hearts (15 min.) and Homeplace Under Fire (29 min.) will follow music and dinner. Ten percent of ticket proceeds go to Grow North Texas and $1 of every ticket sold supplies three meals for the North Texas Food Bank. The $52 price represents the 52-percent decrease in farm income since 2013. 6 p.m.: Green Carpet and pre-reception for Opening Night starts at 6:00 p.m. for patrons with passes and $35 tickets. 7:30 p.m.: The official kick-off of EarthxFilm, this exciting event will feature a screening of Academy Award-winning director Louie Psihoyos’ new film The Game Changers. In the film, Psihoyos delves into the world of veganism, demonstrating the benefits to both human health and the environment of giving up animal products. A reception, drinks, and discussion will follow the screening. 7:00 p.m.: Celebrity icons and heroes in sustainability and conservation will walk the green carpet at the Perot for the 2018 EarthxGlobalGala. Multiple Grammy-nominated artist Colbie Caillat will perform her hits like Bubbly, Brighter Than the Sun, Try, and I Do. Confirmed guests include Buzz Aldrin, Kevin Sorbo, Dr. Sylvia Earle, Captain Paul Watson, Harry Hamlin, Dante Wesley, Arthur RedCloud, Miguel Hoffman, Jorge Heredia and the entire cast of the Real Housewives of Dallas. It’s eco-star-studded evening that honors visionary leaders in environmental education, film, and television with the Global Impact Awards – presented to Garrett Boone, Nike, Parley for the Oceans, Buzz Aldrin, John R. Seydel III and Danni Washington. The global event is also a family affair, co-chaired by Amy Turner and Jenna Turner Alexander, with their parents Jim and Julie Turner as Honorary Chairs. Visit earthx.org to register for the 2018 EarthxExpo at Fair Park and receive free admission. For all details, the event guide is at https://earthx.org/eventguide/. 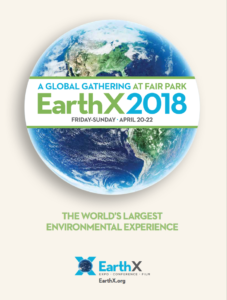 Click here to view the EarthX 2018 guide. Feature Appearance by Sustainable Soundtracks, a new music act from Sweden that is using pop music to raise awareness and stimulate action in the fields of sustainability, ocean sustainability, climate change and more. Business as a force for good can show the way: An Earth Day gathering challenges leaders to find common ground. This week in Dallas, Texas, on the sidelines of EarthX—the planet’s largest environmental expo, conference, and film festival—[the] organization Future 500 is bringing strange bedfellows together for our next series of conversations that will seek to heal the divides. Democrats will sit down with Republicans (WITHOUT SHOUTING! ), and oil company executives will connect with the activists who chain themselves to refinery gates. Our challenge to them all: Find common ground. Prove we can work together to solve challenges and pursue a clean, prosperous future. Festival passes and tickets are on-sale now. For more information, please go to earthxfilm.org. For more information, visit EarthX.org/edu.